Workman Publishing Company, 9780761139669, 64pp. 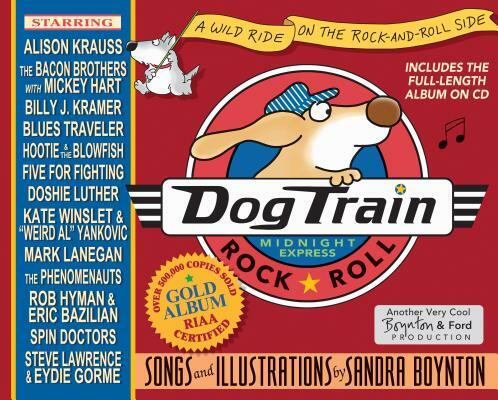 Full of attitude, full of fun, and all lit up with star power, Dog Train is a Recording Industry Association of America Gold Album with 600,000 copies in print. Another great book-and-CD production by Sandra Boynton, it features all original songs recorded by big-name acts and great voices. The full-color book features a portion of each song’s lyrics set as a little story, illustrated with Boynton’s irresistible hippos, cows, dogs, and more dogs. Full lyrics appear in the back. Michael Ford, Sandra Boynton’s esteemed collaborator on Philadelphia Chickens and Rhinoceros Tap, is a classically trained composer and pianist, with a long detour in Progressive Rock performance. He and his family live down the road a spell from Sandy.